I just wanted to offer you some information regarding the church represented by this website. You are welcome to join us for worship anytime we meet. God is looking for worshippers, and He alone is worthy of all praise. Lawson Baptist Church operates under the mandate of our Lord and Savior, Jesus Christ, to reach people for Christ. We have operated as a church body with this mandate for many years. Reaching people for Christ is our mission. 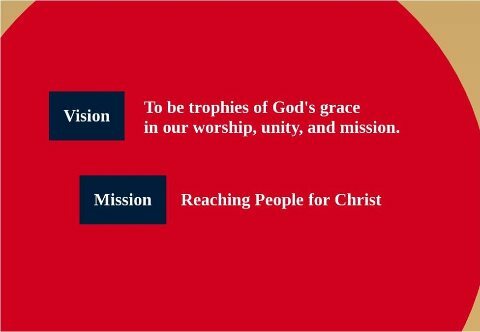 Every ministry effort exerted by this church body is filtered through this mission statement. We exist for God’s purposes and for His glory, and His glory must always be our purpose. God is glorified when His church responds to His great commission. We long to make disciples of all those in our circle of influence. In order to reach people for Christ our vision statement expresses desire…”to be trophies of God’s grace in our worship, unity, and mission.” Jesus commissioned his disciples by saying “you will be my witnesses.” If followers of Jesus are going to reach others with the gospel of Jesus, they must first themselves be a product of the gospel. Believers in Jesus for salvation are, as the great Charles Spurgeon said, “trophies of God’s grace.” The gospel teaches that we are saved and made new by the grace of God alone. If we are anything good and pleasing to God, we are in fact then a product of God’s grace towards us. We long to be what God longs to make us, a trophy symbolic of God’s triumph over our sin by His grace. The evidence of this triumph must be seen in our worship, unity, and mission to reach others for Christ. Pray for us that we will press on in our vision and mission. If we ever get to meet you, we can pray for you too, that God will be glorified in your life.